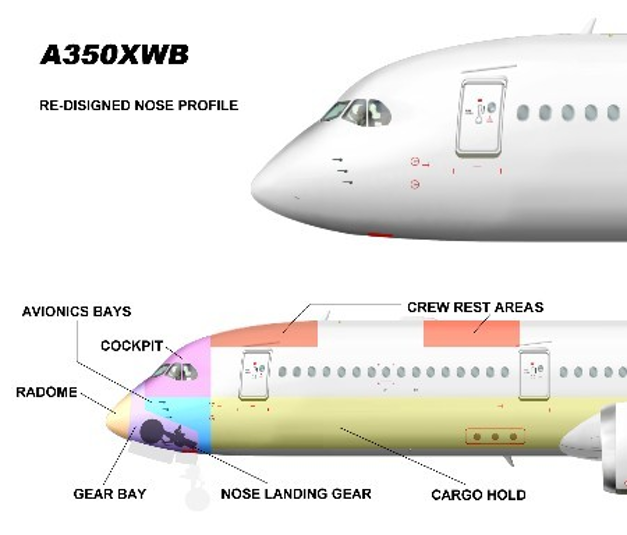 The XWB's nose section will adopt a configuration derived from the A380 with a forward-mounted nosegear bay and a six-panel flightdeck windscreen. This differs substantially from the four-window arrangement in the original design. The new nose will improve aerodynamics and enable overhead crew rest areas to be installed further forward and eliminate any encroachment in the passenger cabin. The new windscreen has been revised to improve vision by reducing the width of the centre post. The upper shell radius of the nose section has been increased. The nose is likely to be constructed from aluminium but Airbus is currently running trade-off studies considering a one-piece carbon fibre structure. According to Gordon McConnell, A350 Chief Engineer, a carbon fibre structure would need titanium reinforcements for birdstrike protection, thus the aluminium structure is the best cost-wise.